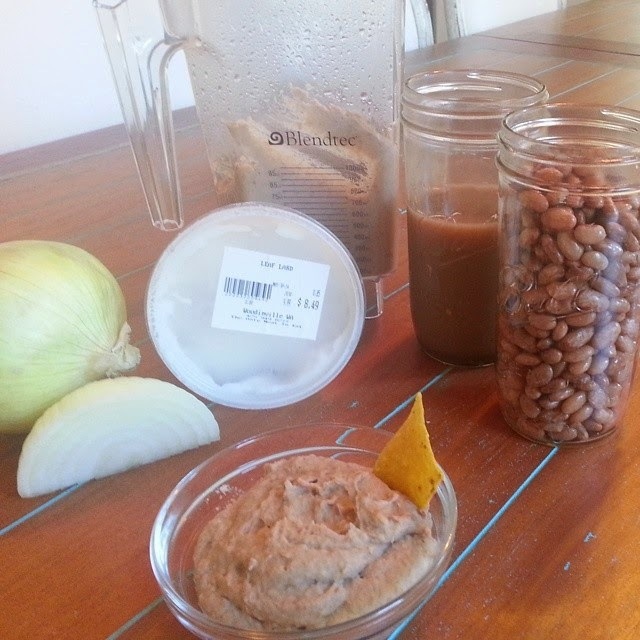 She also has a link of hers to tell how to cook the dried pinto beans. DO THIS. You will not be sorry. It's quick, it doesn't require pre-soaking, and the result is probably the most delicious beans I've eaten ever. So I didn't make quite as much at one time as she did and I played with the proportions a bit. I only used 3 cups of beans and froze the rest, along with the leftover cooking liquid. I used about a cup of cooking liquid, but that all depends on what kind of blender you have to puree. and instead of using safflower oil I used lard because YES PORK FLAVOR IN REFRIED BEANS YES. I cooked that all together, then after I got lazy about the mashing I stuck it in the blendtec. And added a little more cooking liquid for consistency. and the result? Ah-Mah-Zing.